A new design for a hydroelectric generator could cheaply light up off-grid areas. 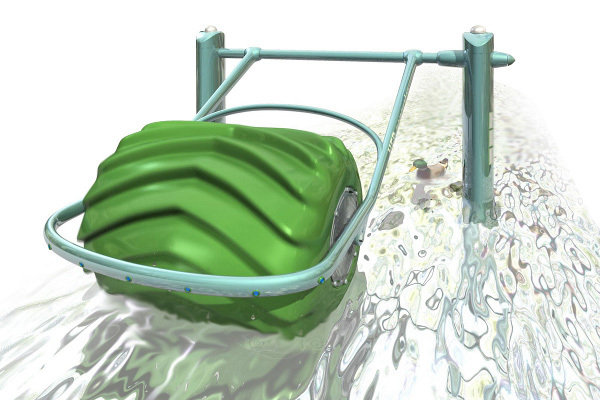 The Hydro-Electric Barrel is a spinning water wheel that floats on the water surface and turns in the current. The spinning motion drives permanent magnet generators inside. It could generate enough power to light banks of LEDs and light up bridges, buoys, or even charge mobile devices in off-grid areas and developing countries. And, because it sits on the surface, it doesn’t disrupt the environment as much as other hydro-power technologies. Is this doable by a very handy husband? Planet of Earth Energy Crisis. Dear Sir, The Subject matter is all over the World facing Energy problem, So I am trying to Explain an idea for Old & New Dams / Reservoirs Hydro electric projects Civil Design Geometry Can be modifying in Architectural Transition to increase our energy potential. Because we are Losing heavy quantum of already storage water in our Big Dams and its relevant projects to generate Hydro Electric old technology, Now it must be need to convert into new theory of Scientific Technology as per utilizing in the way of experiment with foreign expertise at any Hydro electric base Model of concern Department or forum to finalize the following unique and entire world Global developing idea for its further implementations in the current ongoing and next coming future Hydro projects as soon as possible. Thanks. with best regards. Neat idea. Could it be placed vertically and placed underwater out of sight and gain the benefit of the undercurrent which is usually stronger than the surface? With the design of that barrel, placed vertically, the water could flow in any direction and still turn it. A new design for a hydroelectric generator could cheaply light up off-grid areas. The Hydro-Electric Barrel is a spinning water wheel that floats on the water surface and turns in the current. The spinning motion drives permanent magnet generators inside. It could generate enough power to light banks of LEDs and light up bridges, buoys, or even charge mobile devices in off-grid areas and developing countries. And, because it sits on the surface, it doesn't disrupt the environment as much as other hydro-power technologies.